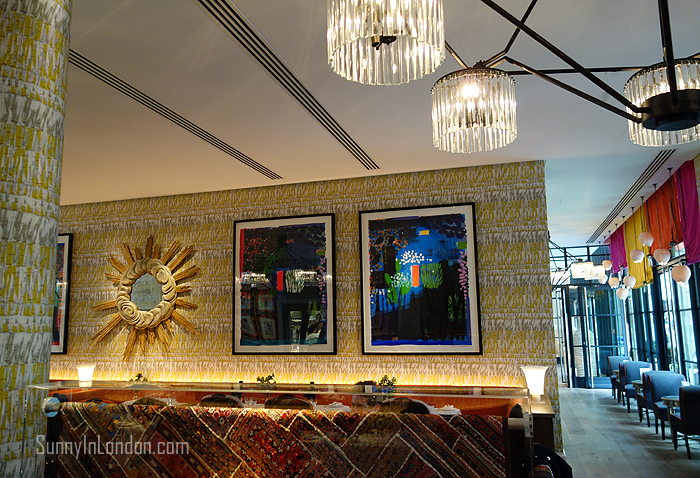 Why did I visit the Ham Yard Hotel immediately after returning to London from my holiday in the US? Because it is simply gorgeous! 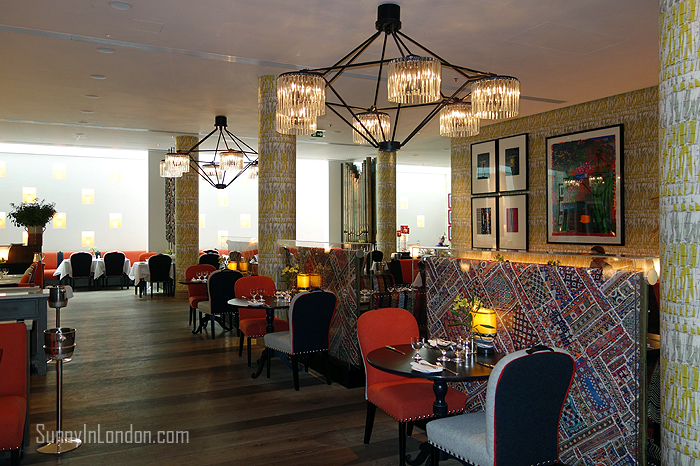 More importantly, it is because my blogger mate Angie from Silverspoon London invited me there for lunch. Because of her wedding and epic one month honeymoon and my new job and trip to the US, we hadn’t seen each other in over two months. So, we felt our lunch date had to be somewhere exquisite. 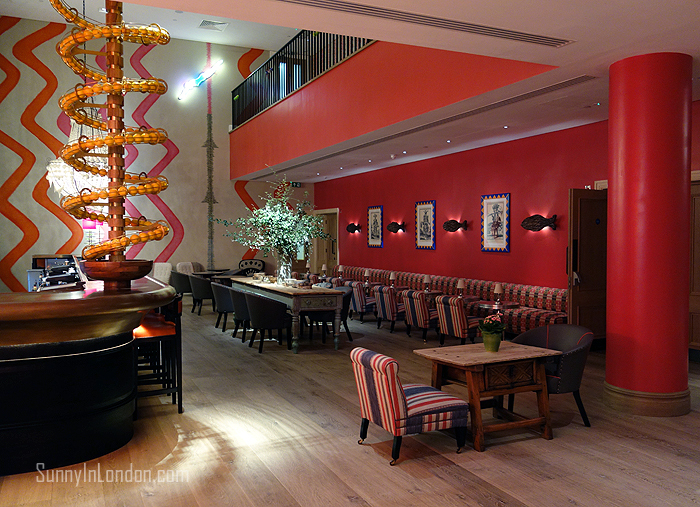 The Ham Yard Hotel is one of eight Firmdale Hotels in London. 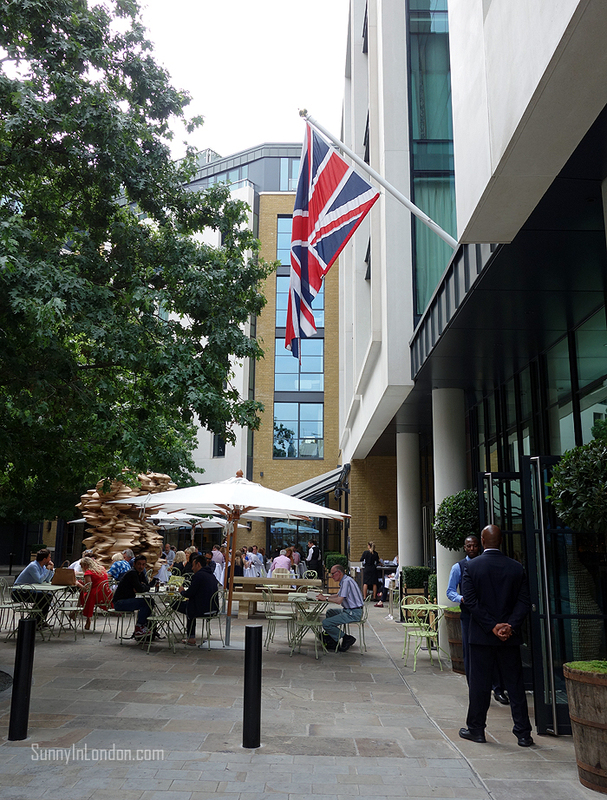 You may remember my recent trip to their Charlotte Street Hotel when I met a group of bloggers for afternoon tea. The afternoon tea food selections are some of the best I’ve had in London. 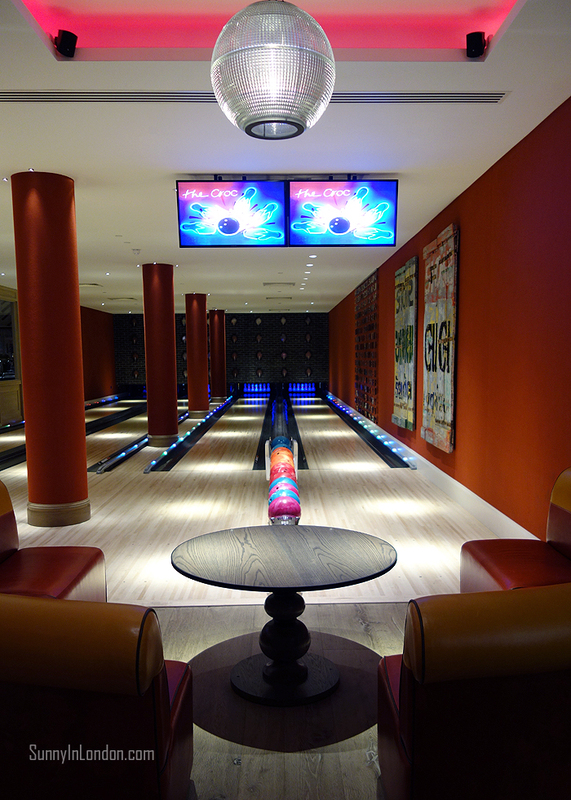 This hotel is located just north of Piccadilly Circus at One Ham Yard, London W1D 7DT. Angie and I decided to order lunch from the a la carte menu in the restaurant. 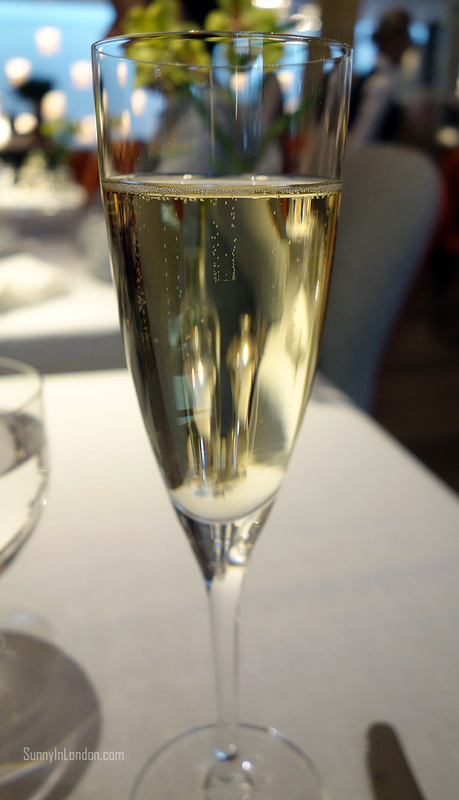 But, first we kicked off our catch up session with a Veuve Clicquot champagne toast. 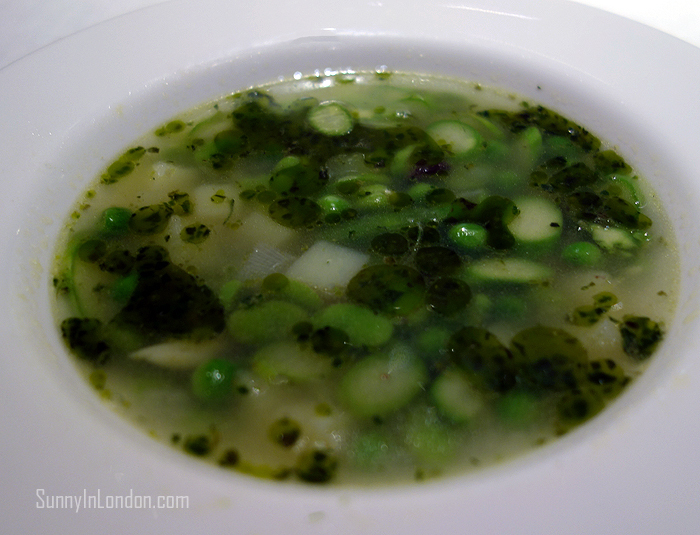 For her Starter, Angie had the Summer Minestrone, Asparagus, Peas and Beans. 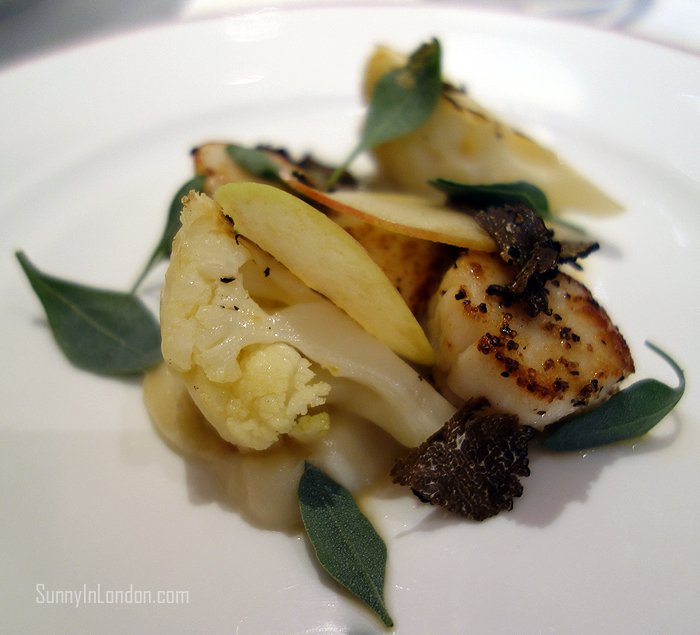 I ordered the Seared Scallops, Tempura Courgette Flower, Crushed Peas, Chilli and Rocket. 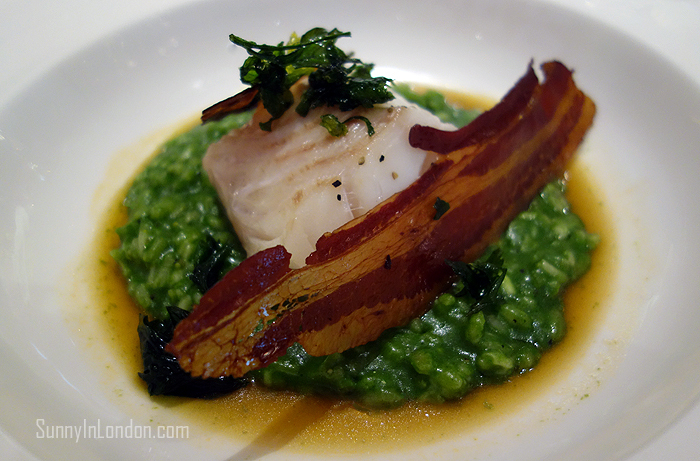 For my Main course, I selected the Poached Cod, Parsley Risotto and Pancetta. The flavors were excellent. Yet again, I would not have complained about an additional scoop of risotto or piece of pancetta. 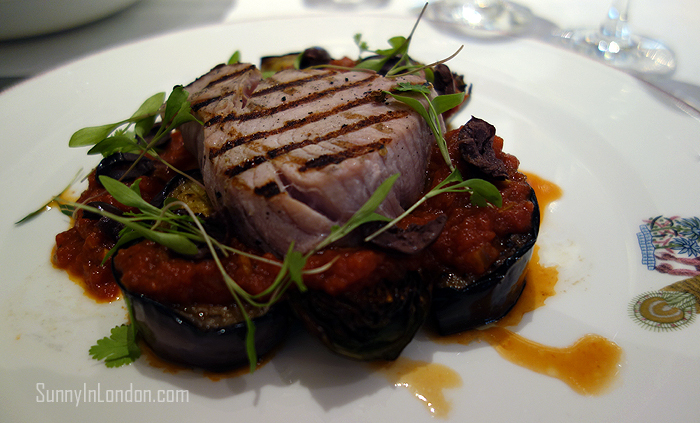 Angie’s Grilled Tuna, Tomato Braised Artichokes, Aubergine and Olives looked fabulous. She indicated it was tasty too. 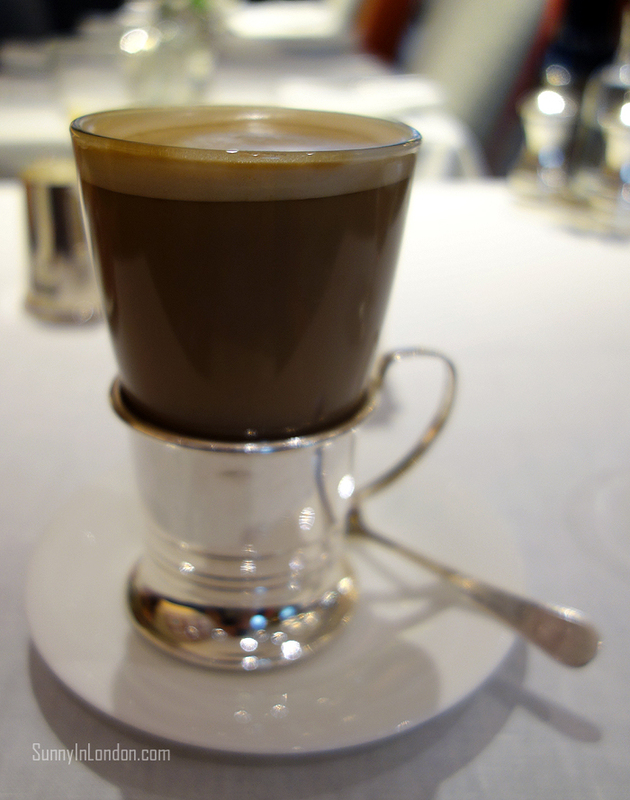 As we finished sharing our recent life and blogging adventures with each other, we sipped on post-meal coffee drinks. Then, we jumped up for a quick look around the beautiful hotel. 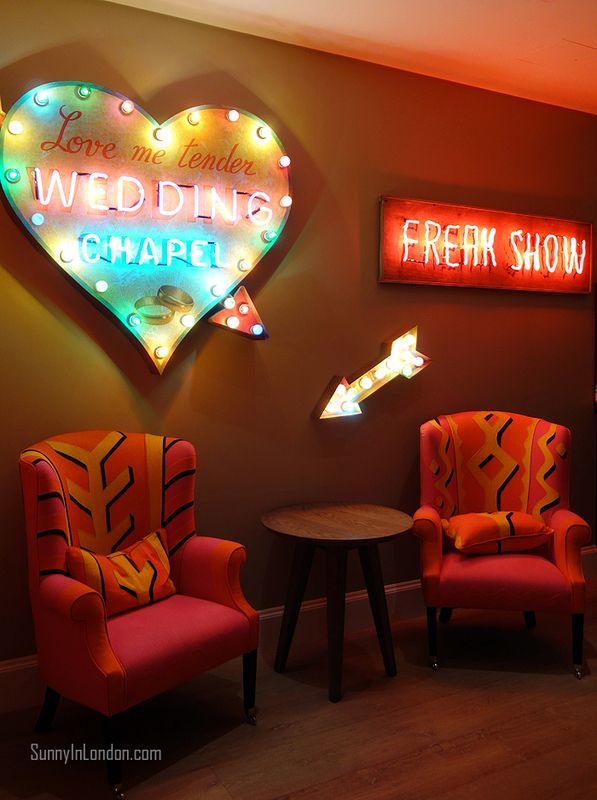 The signature interior design of Firmdale Hotels is certainly evident. 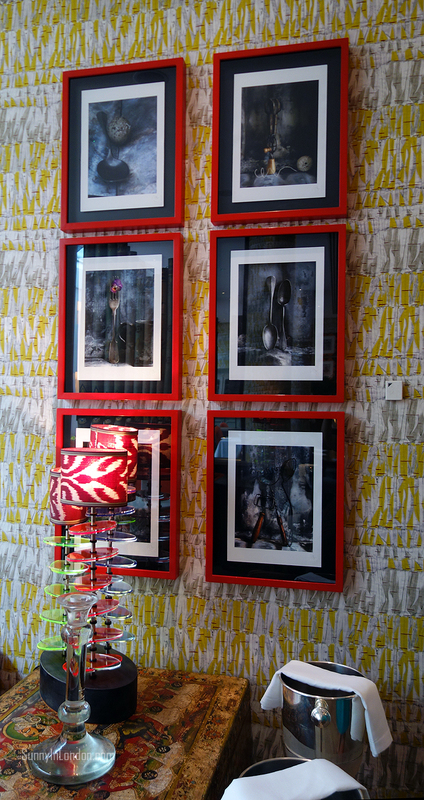 Every room and corner features an explosion of the rainbow that exudes energy, style and personality. Tossing off our heels in exchange for some of these flat kicks was pretty tempting. I’m sure if we had opted for a bottle of Veuve Clicquot instead of just a glass of champagne each, the photos of us in our dresses skidding down the alley would probably exist. (Or maybe they already do and can be sent to the highest bidder!) HAHA! 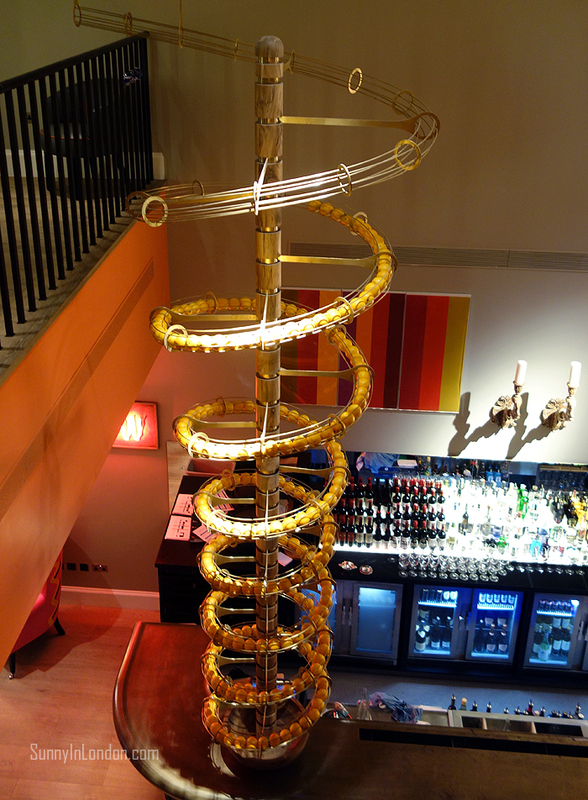 All kidding aside, I found it hard as a Florida girl not to take a souvenir home from this spiraling art work. That’s 178 oranges circling from the ceiling for ya’, Sunny friends! 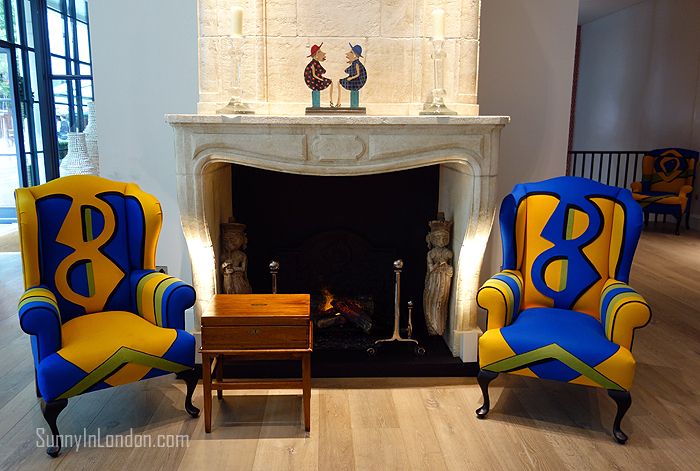 I would certainly recommend this hotel to anyone travelling to London. I know I’ll return often for food and drinks. Next on my list is trying their afternoon tea. 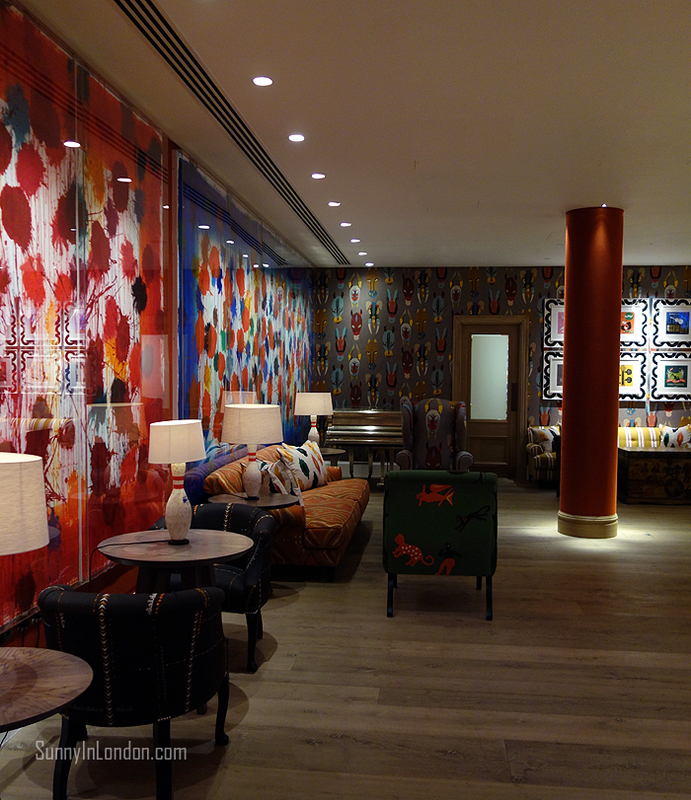 If it’s anything like what they offer at their Charlotte Street Hotel, it will be nothing short of amazing. Has anyone tried it yet? 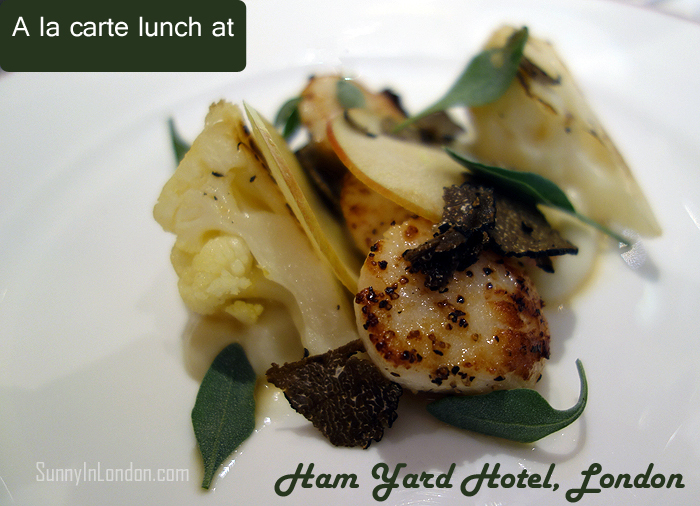 Read here for Ham Yard Hotel reviews and rates. Whyte and Brown Restaurant- It's Clucking Great! Hi Lucy! Yes, it’s always fun catching up with Angie. 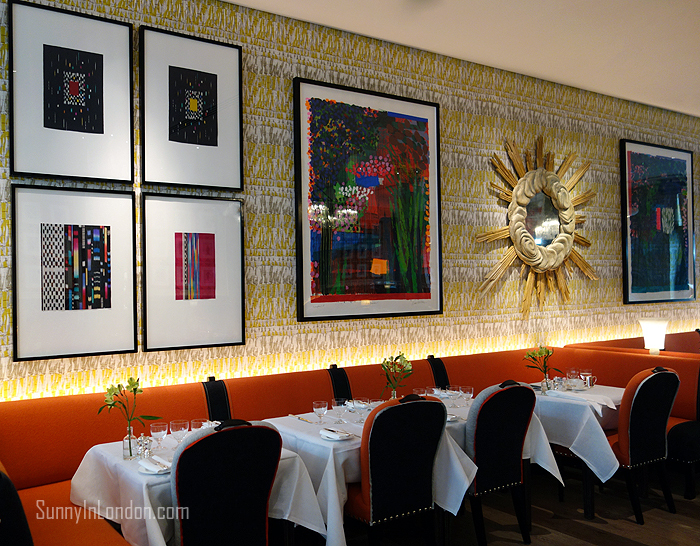 Their interiors at Firmdale Hotels are so stunning. I absolutely will try this hotel’s tea soon. We should plan a lunch or cocktails date soon! Thank you for reading and commenting, Jessica! I regret that we didn’t try dessert. The menu looked really delicious. I agree, portion sizes make a big difference. I will say when I went to their Charlotte Street Hotel’s afternoon tea that there was no way I could finish everything. And I can usually eat quite a bit!